Security Bank and Springfield Business Journal are proud to bring you the 11th annual Women of Influence. This program honors local women for their contributions to the Springfield area community. Selected by their peers through submitted nominations, all have made important contributions to the community at large. Nominations were not limited to the business community for this program. The Springfield area’s reputation as an exemplary place to live, work and raise a family is dependent upon the day-to-day hard work and vision of each and every one of us. These women are significant for their valuable contributions in making Springfield an outstanding community. You are invited to join us in celebrating their achievements at a reception on Tuesday, May 13, at Erin’s Pavilion in Southwind Park. The reception will be held at 5 p.m. with an awards ceremony to follow at 6 p.m. Please let us know if you plan to attend by calling 217-726-6600 or emailing info@springfieldbusinessjournal.com. Role: Director of Human Resources and legal counsel for Tom Lange Company, Inc.
Motto: It can’t hurt to ask. Interesting tidbit: Beuning moved here in 2006 and didn’t know anyone and was very fortunate to be invited to a meeting of Illinois Women in Leadership. The group has been tremendously important to her in developing a network and sense of community. Sarah Beuning sees challenges as opportunities. She grew up in Sauk Centre, Minn., and has three younger brothers. Her parents placed a real emphasis on education and being involved in the community. “They were incredible role models for education,” said Beuning. She traveled abroad and gained a wide world view and an understanding of her place in the world. “I take advantage of every opportunity to learn and grow,” said Beuning. Her parents taught her the value of an education and the importance of community. Beuning is open to all kinds of people. “You can learn from anyone,” she said. There was no question that she was going to go to college and graduate school. ”As a kid, not everyone gets that,” said Beuning. She always believed she could do anything she set her mind to. Beuning is very goal-oriented and a problem-solver. “I was always interested in the law and wanted to be a lawyer,” she said. “I enjoy the process of learning about the law.” She wanted to be involved in her profession and is licensed to practice in three states. She has had the opportunity to work in both law firms and private industry. Other community organizations she has been involved with include Springfield Young Philanthropists, Community Foundation of the Land of Lincoln, Girl Scouts of Central Illinois and the Illinois State Bar Association High School Mock Trial Tournament. “I mostly do what I like,” said Beuning. She wants the opportunity to grow and learn more and take on new responsibilities moving forward. “I aspire to not be afraid of change,” said Beuning. Motto: Those who have good health and sound mind, how lucky and blessed we are. Those who have that have a moral obligation to help those less fortunate than we are. Interesting tidbit: I helped a patient who couldn’t qualify for public assistance obtain medical help and supplies he needed. He was so appreciative, he broke into tears and held my hand. That is a very precious memory to me. Shipra Somani might possibly be busier now as a retiree than she was during her nearly 50-year career as a social worker. Somani, retired since 2005, began her career in 1960 as a caseworker at the Child Guidance Center in Calcutta, India, for four years. Next, she worked as a neighborhood development supervisor for the Hill House Association in Pittsburgh from 1966-1974. Finally, she came to Memorial Medical Center in Springfield as a renal social worker in 1974. Somani has been here ever since. “I came to Springfield, because my husband took a job with the (Southern Illinois University) school of medicine, and so I had to follow,” Somani said. “I always worked. I don’t enjoy sitting at home. I’m not a good housekeeper, and I don’t enjoy decorating and shopping. Somani worked with dialysis patients in a wide range of capacities. She helped those patients with transportation to and from treatment, arrangement of home health care services, enrollment in Medicare and disability benefits and general counseling. Somani still greatly enjoys working with people. She’s extremely active as a volunteer for various organizations. She has volunteered for the Ronald McDonald House charity, is a member of the National Kidney Foundation of Illinois and is a volunteer for the Simmons Cancer Institute, among a host of others. 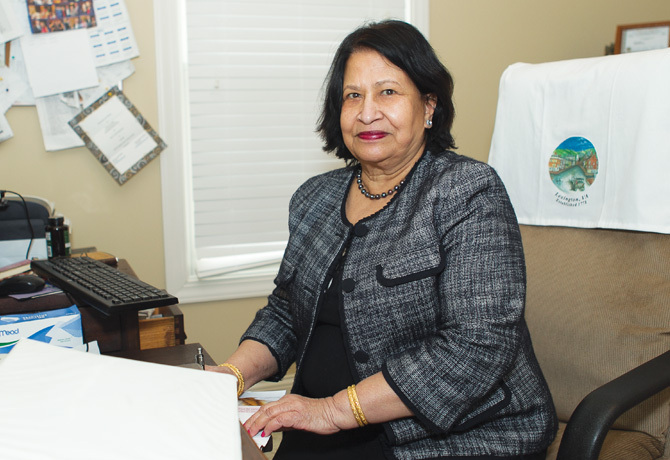 Somani is also a member of the Asian Indian Women’s Organization, a Springfield-based nonprofit that also works with a number of charitable organizations under its own umbrella. Somani, a devout Hindu, is also a board member and executive for the Hindu Temple of Greater Springfield, located in Chatham. She was also one of the primary donors, she said, in the purchase of the church a handful of years ago. Despite her daughters’ seeming inability to reach Somani via phone – “I’m terrible with returning and checking messages” – she still sees them quite often, she said. Her younger daughter lives in Denver, and her eldest lives in Washington, D.C.
To say Somani has a full plate is a bit of an understatement. Does she plan on slowing down, and perhaps reducing the amount of time she spends with charitable organizations or her involvement in the Hindu Temple? “I do not think so,” Somani said. “I enjoy being busy. It’s probably just my nature. I enjoy bringing change. Part of it is personal satisfaction. Interesting tidbit: I learned to sew in 4-H and made a lot of my clothes in high school – everything from a winter coat to a bathing suit. When Tonya Voepel prepared for a 60-mile breast cancer awareness walk in 2002, she was shocked at how much money was spent on shoes. She was also shocked at how empowering it felt to raise money for a worthy cause. And that is where the Share the Spirit Foundation began. Tonya and Karen – she lives in Colorado – each hold annual “Shoes for Kids” events in their home states and have done so since Share the Spirit officially began in 2003. Donors are invited to the events so they can help firsthand with the children and also get an opportunity to see their money at work in the community. While Tonya focuses on her Illinois shoe events, Karen is doing the same in Colorado, but the two also come together to raise funds for other events as they see fit. With the help of an outreach coordinator, Share the Spirit has organized nature hikes (and the donation of funds and boots needed for such an endeavor), a shoe drive in conjunction with U.S. Army soldiers for Iraqi schoolchildren and fundraising for those affected by Hurricane Katrina in 2005. In addition to all of those activities, the foundation also has an annual holiday outreach for a local family in which gifts, clothing and various items are provided. There is always something in the works, Tonya said. Professionally, Tonya is her own boss at the aptly named Voepel Publication Services, a graphic design business in Springfield she has owned for nearly 20 years. Being able to set her own work hours, Tonya said, has been a huge benefit for her work with Share the Spirit. Coincidentally, knowing a number of other local business owners can also come in handy with fundraising. Of course, Tonya said, fundraising can be a daunting task. But as with anything else, practice makes perfect. “I think you have to put yourself out there, and it can sometimes be uncomfortable, but you have to meet people, and you have to get involved,” Voepel said. “Once I started meeting other people and getting involved with other groups, it got easier to talk to them about Share the Spirit. Interesting tidbit: In my heart, I’m a cowgirl…. Dr. Kemia Sarraf explained the 2008 inception of the genHkids Coalition by citing the “tipping point” phenomenon detailed in Malcom Gladwell’s book of the same name, published in 2000. National problems, Sarraf explained, can have local solutions. She began to approach various organizations in the area that have an interest in a more health-conscious future and the education required to instill those values in the community and its children. The response was emblematic of the tipping point she spoke of. 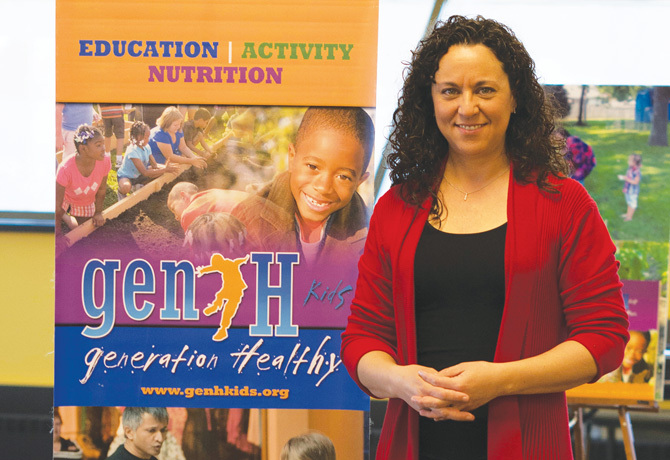 Under two program banners of “Eat real” and “Move more,” genHkids and its numerous coalition partners – from St. John’s Hospital to the American Heart Association – have sought to implement programs in local schools that promote healthy foods and physical activity. The programs are derived from extensive research, Sarraf said, and best practices that already exist and are proven to work. “We do a gradual release of responsibility,” Sarraf said. “We work with you (schools and educators) until you see the value of our programs, until you become more and more comfortable and competent, and then we’ll leave you with some tools. This hands-on approach by genHkids and its volunteers has been so successful, Sarraf said, because public educators are already asked to do too much with too little. Rather than simply developing and distributing toolkits and workbooks, which Sarraf believes to be well-intentioned but not terribly effective, genH volunteers directly implement the programs they develop. In fact, Sarraf said, genHkids’ largest problem now is maintaining the capacity needed to continue adjusting programs and bringing them to local schools. It’s why the mother of four sons works full time without pay for genHkids despite previous thoughts of going into private practice in Springfield. She last entertained that thought back in 2008, directly before founding genHkids. And Sarraf is in it for the long haul. GenHKids is relatively new, and she knows these sorts of endeavors take time. It’s a child-based initiative, Sarraf said, with the intention to instill in said children some very important knowledge for future use. Motto: Love the life you live. Interesting tidbits: My focus has been on my husband. It’s my job to shine the spotlight on him. I had a book published, a photo history of the University of Illinois. I spent a year gathering photos. 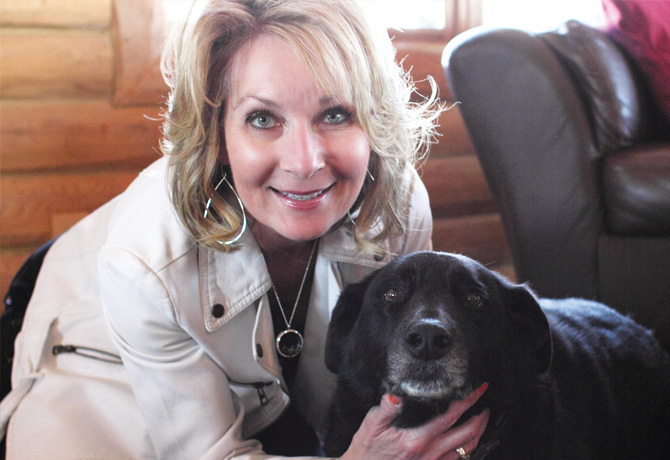 She was always interested in marketing and sales and worked for Design Ideas for eight years. “I got to travel the world and meet interesting, wonderful people,” said Carrels. She thought she knew everything and learned she didn’t know anything. 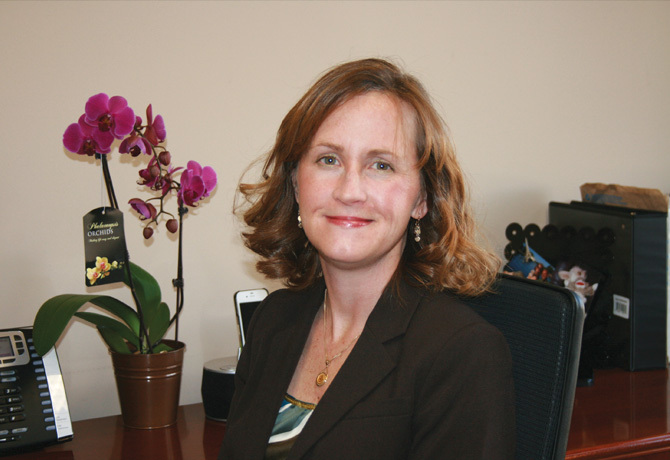 Carrels is the current president of Illinois Women in Leadership, a personal and professional development organization, and is the founding board secretary of the Sangamon CEO, which is about to graduate its first class. The class is having its trade show May 9. “I’m excited to see their businesses,” she said. Carrels said she’s actually very shy. “I like being in the background and not in the spotlight,” she said. “My main job is to make other people look good.” Her public persona is very different from her personal persona. 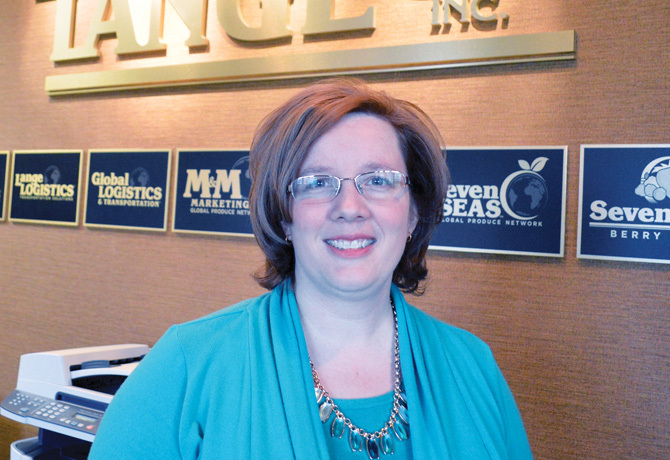 “I love connecting with people,” said Carrels.